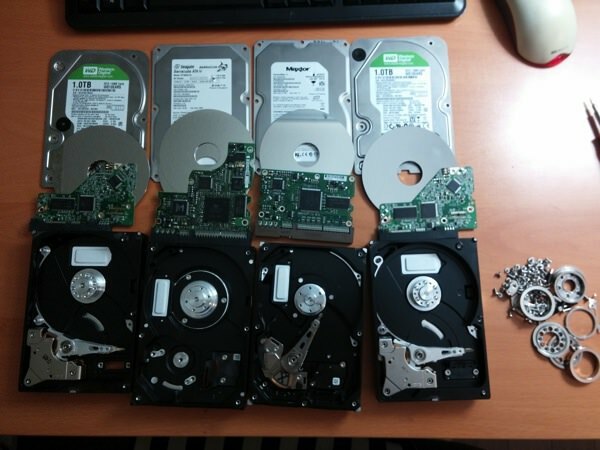 I recently had to destroy a few hard drives before throwing them away, since they contain confidential information. In this picture I have taken out all the PCBs from the drives, as well as all the platters (the metal disks that actually store data). 80 GB Seagate Barracuda ATA IV, date code says it’s from November, 2002. 200 GB Maxtor DiamondMax 21, PATA, from October, 2006. 2x1TB Western Digital Green SATA, from 2009. The oldest of the drives are about 12 years old, and the newest about 4, and I thought it would be interesting to see exactly how technology has changed over the years, through these drives. Obviously the biggest difference is in the platters. All 4 drives happen to have 2 platters – 40GB per platter on the 2002 drive, and 500GB per platter on the 2009 drive. However, they looked exactly the same under naked eyes (exactly the same diameter! ), and I don’t have a microscope, so I am going to focus on the PCBs, and look at how electronics design has changed, and how we are now doing the exact same thing differently from how we were doing it back in 2002. Turned out we can learn quite a bit just looking at the PCBs! All these PCBs do pretty much the same thing – power supply conversion, a main controller that interfaces PATA/SATA to the platter sensors, and a spindle controller to drive the motor, and some kind of memory for buffer. But their designs are quite different. The central processor is ST branded, but I cannot find any information on it, probably because it’s a custom OEM chip. – On the right is a Hynix HY57V161610DTC-6 – 3.3V 166 MHz, 16Mbits synchronous DRAM. – On top of that is a ST M29W102BB – 1 MBit parallel flash memory with a boot block and 2 main blocks. – Above that is a MSC LX8815-33 – dual channel 3.3V 1A low dropout linear regulator… with pretty crappy specs (1.1V dropout, up to 5mA quiescent current). – On top of the main controller to the left is a chip labeled SH6950. I can’t find a data sheet for it, but according to some random site, it’s a TI spindle motor + voice coil motor driver. – The chip on the left of the main controller is an agree MS455. No idea what it is. – The main chip this time is an agere chip. They seem to be making a lot of hard drive stuff. No information can be found for this chip unfortunately. – On the right is a Hynix HY57V641620ETP-6 – 3.3V 166 MHz, 64 MBits synchronous DRAM. – The tiny chip on the bottom left is an Atmel chip, but the part number doesn’t return any results. I am guessing it’s EEPROM for the main controller. – The small chip above the main controller is a Fairchild chip. I am also not sure what it is, but since it’s connected to a big inductor and a big resistive divider, I am going to assume it’s some kind of switching regulator. – On the top right there is another switching regulator, in QFN package. The printing on the chip is too small to read. 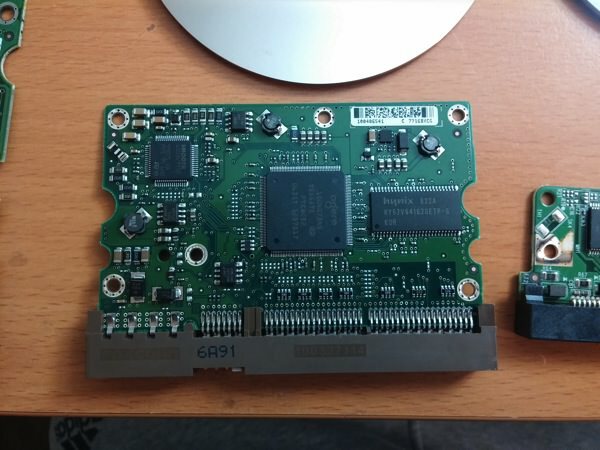 – On the left is Hynix HY50U121622DTP-D43 – 2.5V 133 MHz 512 MBit DDR synchronous SDRAM (note that even though the clock frequency here is lower, data is transferred on both edges of the clock, so it’s equivalent to 266 MHz data rate SDR). – The only other chip is a Smooth L7251 spindle motor controller. It’s interesting to see how many electronics trends can be seen in just these 3 PCBs. First of all, there is a clear trend in reducing number of ICs. 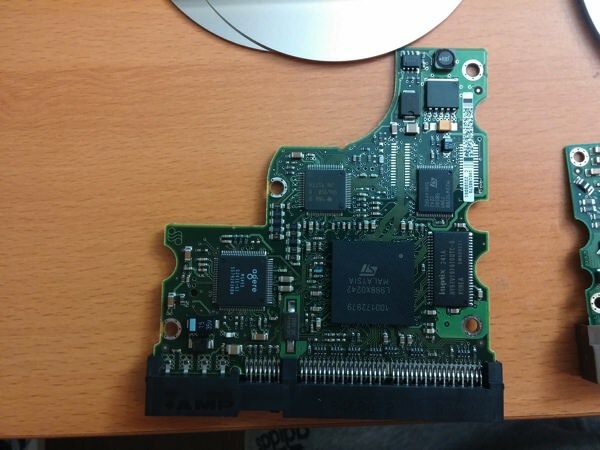 The first board had 8 chips each doing very specific things, and the 1TB drive only has 4 chips, with most things integrated into the bigger chips. This is mostly to save cost. Many more chips are custom designed for single products now than how it used to be – IC manufacturers making small chips to do very specific things, and circuit designers putting them together to do what they want (like in the first hard drive). Looking at the PCBs, I am surprised most ICs are still TQFP instead of BGA. Most electronic designs have moved on to BGAs now for space saving and better signal integrity at higher speeds. Interestingly, the only BGA chip here is the main controller on the oldest board. However, looking from the side, it seems to be about 1.2mm pitch (distance between balls), which is huge by today’s standards. Most modern chips are going 0.5mm or lower, and require more precise placement using optical alignment. The oldest PCB has almost all 0805 (0.08” by 0.05”) and 1206 passive components. That’s pretty huge. On the 200GB board, we are mostly down to 0805 and 0604. On the 2009 board it’s almost all 0402. The routing on the oldest PCB definitely looks less dense than the other 2. It looks like it’s roughly 8 mil traces and 8 mil spacing, whereas the newer boards use 6/6. The old board also seems to have a HASL (hot air solder levelling) finish (or some kind of organic finish? though I don’t think they existed back then), whereas both the new boards use immersion gold (ENIG). Immersion gold offers better planarity (good for BGA chips that require pads to be perfectly flat) and oxidation resistance (so boards have longer shelf life before soldering). 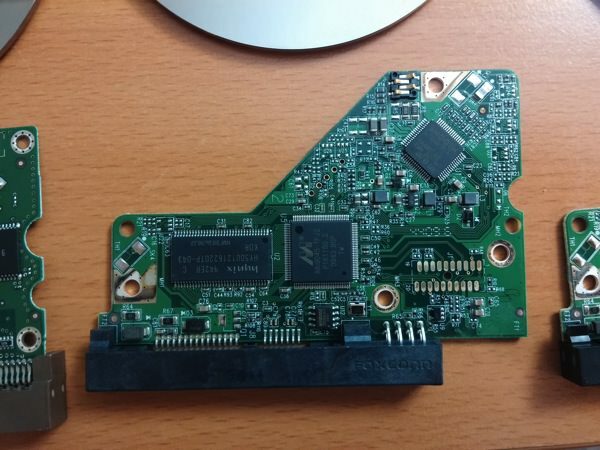 Since the new board also doesn’t have any BGA chip, there is really no need for ENIG. It’s possible that the cost is not much higher in recent years, so they are just doing it with all boards now. Maybe ENIG wasn’t popular back then? Maybe it didn’t exist back then? It was already popular when I started doing electronics about 5 years ago.